BPSC Download Additional Result Check Here. BPSC Officer, Registrar, Superintendent & Others 2018 Result Check Here. BPSC Officer, Registrar, Superintendent & Others Answer Key 2018 Check Here. BPSC Officer, Registrar, Superintendent & Others Exam Mains Admit Card Check Here. BPSC Officer, Registrar, Superintendent & Others Exam Date Notice 2018. BPSC Notification is out. 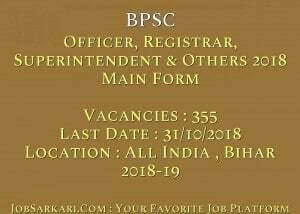 BPSC is recruiting for 355 Officer, Registrar, Superintendent & Others 2018 Main Exam Posts. 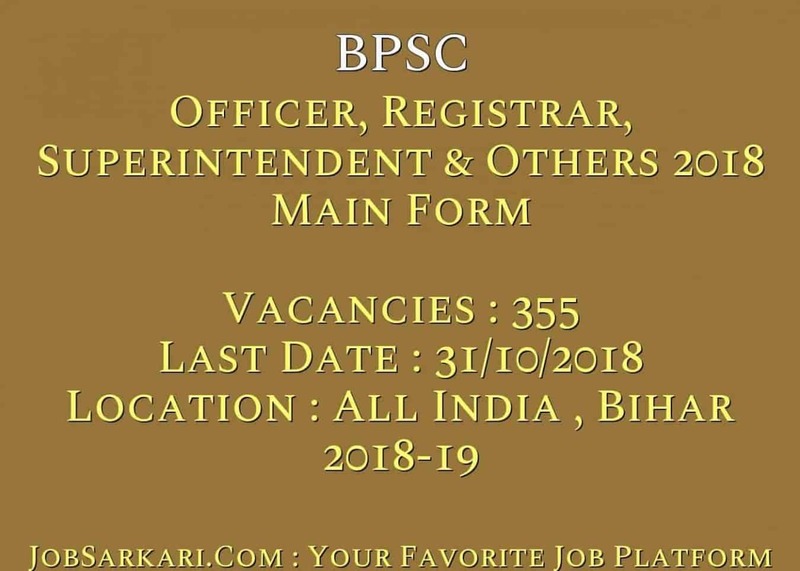 You can check BPSC - Bihar Public Service Commission last date, download BPSC notification, visit BPSC official website and check other BPSC Vacancy details.Complete Vacancy and recruitment Details about 355 Officer, Registrar, Superintendent & Others 2018 Main Exam vacancies in BPSC are provided below by JobSarkari.Com only for you. Last Date for Apply Online (Mains) 31/10/2018. Last Date to Complete Form Mains 06/11/2018. Last Date for Receipt of Application Form (Mains) 20/11/2018. SC / ST / PH Rs.200/-. Dy. Superintendent of Police 06. Total No of Post 355. Maximum Age (Male) 37 Years. Maximum Age (Female) 40 Years. 6.Online Application Can be Submitted on or before 31st October 2018. Q. What is the Last Date For BPSC Officer, Registrar, Superintendent & Others 2018 Main Exam Vacancy ? A. Last Date for BPSC Officer, Registrar, Superintendent & Others 2018 Main Exam Posts is 31/10/2018. Q. What is the Form Type of BPSC Officer, Registrar, Superintendent & Others 2018 Main Exam Recruitment ? A. The Form Type for BPSC Officer, Registrar, Superintendent & Others 2018 Main Exam Posts is Online. Q. How many vacancies are available in Bihar Public Service Commission Officer, Registrar, Superintendent & Others 2018 Main Exam Posts ? A. There are about 400 Vacancies in Bihar Public Service Commission Officer, Registrar, Superintendent & Others 2018 Main Exam Posts. Q. What is the Full Form of BPSC ? A. Full Form of BPSC is Bihar Public Service Commission .